Every hair appointment at Sculptures begins with a consultation with one of our highly trained stylists to ensure that we enhance your personal style. Enjoy a luxurious shampoo and conditioner in a quiet and peaceful environment. Relax in our state of the art chairs while our well trained team perform a scalp massage which will leave you feeling stress-free. 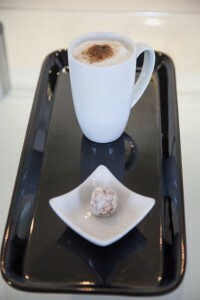 You will be offered a complimentary cup of coffee or tea with one of our delicious date balls on the side. While having colour enjoy our complimentary muffin or lunch of the day and read one of our modern magazines to keep you up to date with all the new trends. With 10 stylists to choose from, whether you are looking for regular trim or a new look, great hair begins with a great haircut. From playful up-dos to cute ballet buns, messy top knots or a classic chignon we can create your desired look. Stay right on trend, men’s grooming from edgy cuts to classic men’s styling and beard trims. Suitable for all hair types including colour treated hair. Inoar contains the minimum formaldehyde to ensure hair is healthy, smooth and manageable. Removes frizz, reduces volume and shortens drying time. Relax in a luxury hair spa. Foils are strategically placed to create delicate threads of colour through the hair or a few colour placement foils for enhancement, suitable for all hair types. Perfect for those trying out colour for the first time, this free hand technique is suitable for all hair types creating soft natural looking highlights with added texture, low maintenance colour. An all over permanent colour that is either a simple root re-touch or used to enhance your natural colour. We do complimentary halo tints for regular clients that need to upkeep every 3rd week as an in-between at no charge. Bespoke colouring to add excitement and drama. Strategically placed foils can be used to create 3D colour effect. We stock a vast range of professional styling products to meet all your hair care needs.